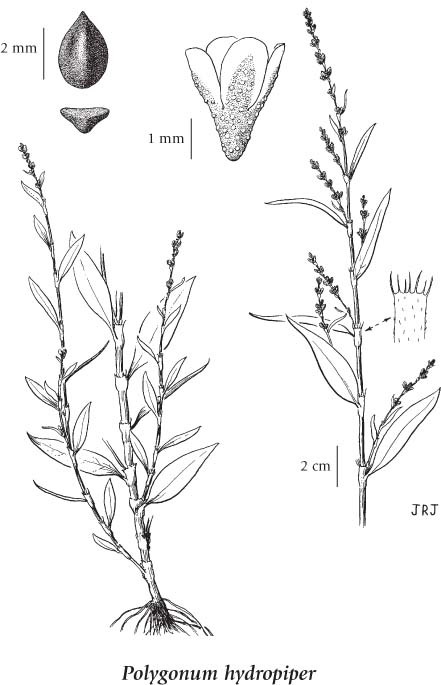 Marshpepper smartweed is an introduced Eurasian species that is found in the southwestern and south-central part of the province. Annual (occasionally perennial) herb from fibrous root; stems ascending to erect, several, simple to branched, tending to root at the nodes, more or less finely pitted or gland-dotted, peppery-tasting, 20-100 cm tall. Basal leaves lacking; stem leaves alternate, lanceolate or elliptic-lanceolate, sparsely hairy to smooth, the blades 3-7 cm long, somewhat reduced upward, the stalks short; stipules oblique, up to 15 mm long, usually sparsely hairy and fringed with bristly hairs at the top. Inflorescence of axillary and terminal, spikelike, scarcely interrupted, drooping racemes, 2-7 cm long; perianths 2.5-4 mm long, glandular-dotted, greenish with white (pink) margins, usually 4-lobed about 2/3 the distance to the base; stamens usually six. Achenes, lens-shaped or 3-angled, brown, finely glandular-dotted, dull, 2.5-3 mm long. Closely related to P. punctatum. Moist ditches, shorelines and disturbed sites; common in SW, infrequent in SC BC; introduced from Eurasia.